(2). 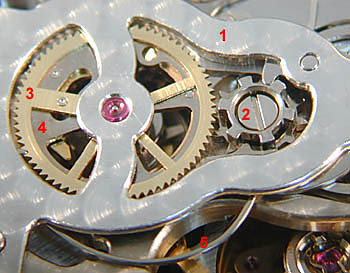 The single finger trips both minute and hour accumulators as the center pinion rotates. 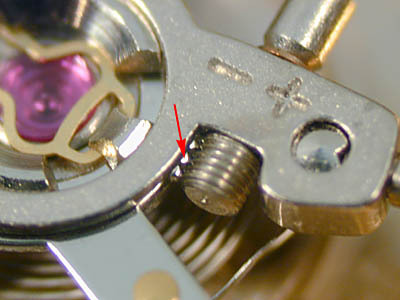 (1) about to trip a tooth on the minute accumulator intermediate wheel. The hour intermediate wheel is on the other side. 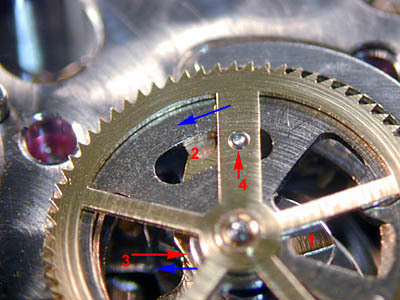 Because the hour intermediate wheel is tripped once each minute, there are two intermediate reduction wheels between the hour intermediate wheel and the hour wheel itself. (2) are detented by simple steel jumper springs. 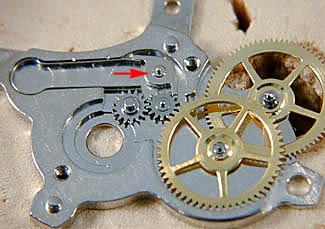 The jumper springs assure that the hour and minute accumulators indicate whole increments and serve as brakes for these wheels. 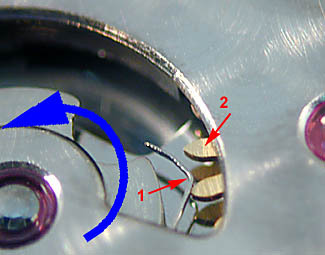 The hammers operate against the logarithmically curved heart cams, forcing the cam to rotate until the hammer lies in the “top” concavity of the heart (opposite the apex). This is the zero position for all registers. 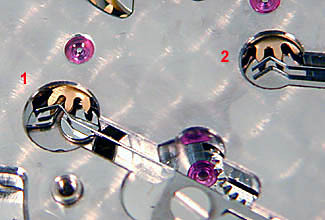 The center wheel and hour accumulator hammers are indicated at the arrows, right. (arrow). 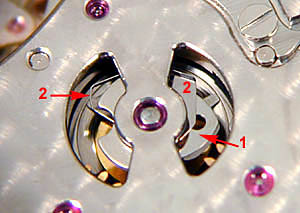 On an automatic winder, the watch must rotate clockwise (as seen from the dial side). 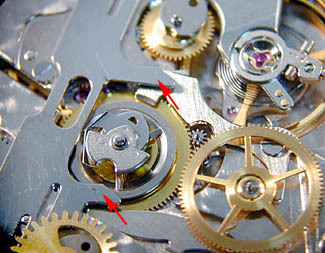 The ball bearing carrying the rotor is replaceable by simply replacing the cover of the unit. (1) to realign the rattrapante hand with the main hand. (2). 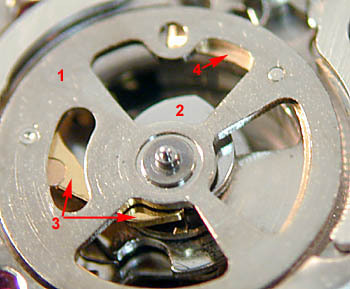 The column wheel acts on the scissors at the arrows. Brake activation and release are instantaneous, precise, and balanced. 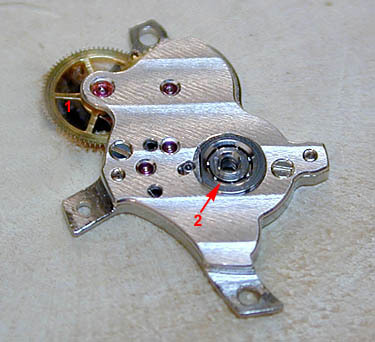 (left), a three spoke Glucydur balance with KIF shock protection. (left) is an easy-to-use, low backlash, worm gear mechanism which is much more positive in action than the more common, friction-operated Triovis adjuster. 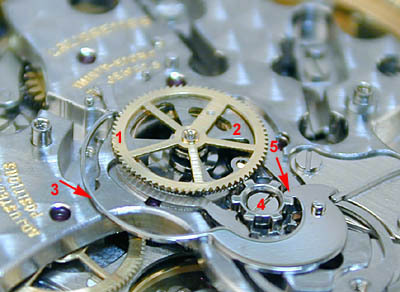 For originality of engineering and precision of chronograph function, the Piguet chronographs are without peer. For quality of workmanship, they are among a tiny handful of the very best, including those from Lange, Patek, Vacheron, and Audemars. 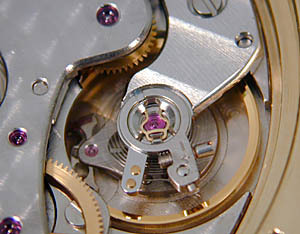 Although more simply decorated than those of Lange or the Geneva firms, the Piguet finish, including functional finish, is immaculate. Available in a variety of watches, most notably from Blancpain, the simpler Piguet chronographs can offer excellent values. 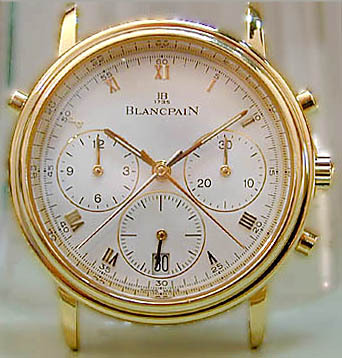 The rattrapante–which carries a US$20,000 premium over the simple chronograph–seems inexplicably expensive. 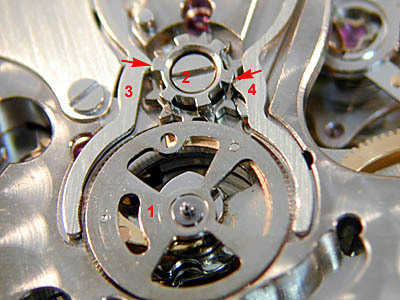 According to M. Humbert, former Professor of Special Chronograph Courses at the School of Watchmaking, Bienne (“The Chronograph: Its Mechanism and Repair”), the distinguished rattrapante return lever lifting mechanism may stem from an 1891 Swiss patent. 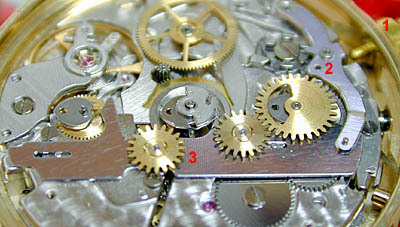 Regardless, it is a wonderful refinement on the rattrapante mechanism and is, to my knowledge, available only from Piguet.